No matter how far we go, no matter how old we get, our schools stay with us. For better and for worse. All of my novels contain scenes that take place in schools (or on school sports fields) and while these have been partially shaped by my work and my imagination, the strongest influences are still the schools that I attended as a child. One of these schools, MacLean Elementary, no longer exists. Or, rather, the building is still there, but now hosts a French school (when I was a kid, the best place in town to learn French was the back of a cereal box). 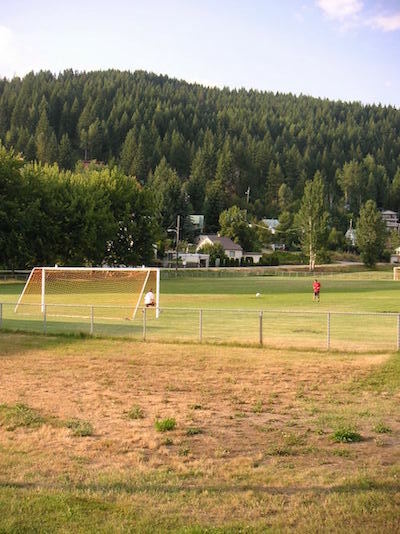 Rossland Secondary (RSS) still exists too, but it only goes up to Grade 9, having graduated its last class in 2013 (it is now known as Rossland Summit School). High school students travel make the trip up and down (down and up?) the Trail hill each day for their last few years in school. Still, when I went to do an author visit at my old school, walking through those unchanged hallways into that unchanged auditorium brought back memories of a vividness, detail and immediacy that I had not expected. I even ran into my third-grade teacher and seventh-grade volleyball coach. Then the students filed in, filled with anticipation at the freedom of summer. The school’s wonderful librarian introduced me as a graduate of the school, which was a prouder moment than I had thought it would be, so many years after I’d left. In the talk, I tried to convey a little bit about what growing up in Rossland had meant to me and how it had influenced my writing. The students were intrigued at first, but I soon sensed them growing restless. Getting children to believe in the world before they existed can be done, but it is always, in my experience, an uphill battle. And so I launched into readings from my books and questions from the audience. And boy, they had questions. Great questions. Questions on writing, on Japan, on sport—on whatever most mattered to them. The morning concluded with a critique session in a Grade 8/9 classroom where I gave editorial advice to (anonymous) creative writing submissions. The talent on display was exceptional, as was the desire to improve and edit their work. Rossland seems certain to produce many talented writers in the future. The same week, I was also fortunate enough to visit the Rossland Seven Summits Learning Centre, a new and innovative school designed to provide personalised learning to high school students in Rossland. With so many of the students reaching that time in their lives when they want to get out and experience the world, I focused much of my talk on Japan. One student did come up after and say that she wished there were more books out there about the combination of fear and excitement of moving from a small town like Rossland to the big city. One of my books is sort of about that, though the character moves along with his family as the book is for younger readers. Remembering my own anticipations and trepidations when I left Rossland in ’99 for university, I definitely agree with that student. Fits perfectly with one of my main views on writing children’s books: don’t rewrite the books you loved to read; write the books you wish you could have read.